Titan Business Suite’s executive offices and workspace leases in Katy are designed to meet the needs of businesses both large and small. The Katy business suite leases are move-in ready, available on flexible terms and, as an executive client, you will receive the full benefits of our state-of-the-art infrastructure and access to all office amenities. With Titan Business Suites and office space in Katy, you can grow and adapt according to your specific needs. A Titan Virtual Office will give you all the benefits of a professional business address, a private office, and a receptionist to handle calls to your specifications. Project the image of a traditional professional office while maintaining a flexible work environment. Concentrate on growing your business, not your expenses. 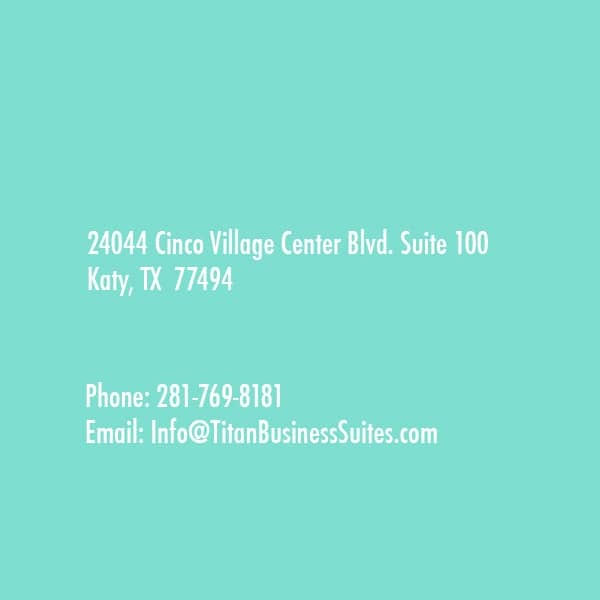 Titan Business Suites provides executive meeting space leases in Katy at a price you can afford. With the ability to hold conference calls, access visual aids and facilitate a meeting with both comfort and privacy, we provide the perfect solution for your business to use, on demand. Book space for 1 hour, 1 day or 1 week. Impress both your clients and staff with our state of the art meeting room facilities in Katy. The right partnership can provide the most powerful tools in business today. In order to confidently grow your business in today’s unpredictable marketplace you need to partner with a team you can count on to provide you with the necessary tools for success. More than ever, business success requires more than just hard work. Selecting the best workplace environment is essential to the success of your company. Whether you need executive office space, a virtual office solution, or a professional meeting space, Titan Business Suites provides a wide array of workplace options guaranteed to meet your needs, and exceed your expectations. Titan Business Suites offers newly renovated, furnished executive offices at a price almost any budget can afford, and at terms that are the most flexible. Our virtual office services designed to make your mobile business feel grounded, while our meeting room spaces are fit for meeting both large and small. If your business requires only intermittent access to office space, Titan Business Suites has multiple virtual office packages available. Your business can select the flexible options you need, giving you a professional office when needed- and only then. You’ll never have to compromise quality for cost! Our plans start at the low cost of $50.00 a month. Contact us today to see what plan fits your growing business needs. Check out our Virtual Offices for more information. If your business has associates or clients coming to town, and you don’t have suitable meeting space, Titan Business Suites offers stylish Meeting Room solutions to host whatever guest you may have. We have multiple modern, spacious meeting rooms and areas available for rent, complete with WiFi & internet, easy to use A/V services, and access to our gourmet coffee bar. Our concierge services allow you to focus on your business and leave the rest to us. Let us help you take your meetings from the coffee house, to a prestigious business class experience. Plus, you can enjoy free coffee, tea, latte’s, cappuccinos, and even espresso at our center. Call or go online today to book your next Meeting. Ready to make the move to an upscale office space, virtual office, or book your next meeting? If you’d like to schedule a tour or find out more information, send us a message and we’ll get back to you promptly. Titan Business Suites is located steps from the upscale La Centerra Center and just off Grand Parkway. Find us at the intersection of Cinco Village Center Blvd. and Cinco Ranch Blvd. just behind the “My Place Learning Center”, next to “Realm Real Estate Professionals”.